This is a demo of a game. It's been refurbished from a small project I started three years ago. I will continue with this project if there is enough interest in it. Very basic game, but it's a nice start nonetheless! - You could post a video of the game in this itch.io page, some people may not want to download your game without seeing a video first. 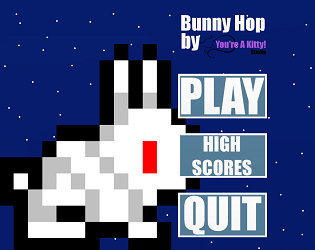 - You could show some instructions in-game, like the keys used to move the bunny, how to jump, a warning to avoid the enemies, an explanation of the powerup items, etc. - The arrow keys could move the bunny too, in addition to the WASD keys. - When you collect a powerup, there could be more feedback (the bunny could flash a little, a sound effect could play while the powerup is active - think Pacman power pellets). - I didn't understand how the game's scoring system works, it's missing some feedback when you collect the items or kill the enemies. - The music is a nice but repetitive beat, there will be more different music later, I presume? Thanks for the feedback! I'll keep it in mind!